I had REALLY good intentions for a MTM today but H woke up cranky & hungry so I had to move fast. I had wanted to do a spring theme with flowers (including the new ham flower I learned! ), butterflies and everything but I really only had time to create the sun. The egg was going to be a baby chick but H just couldn't wait another minute - I should have finished that when she was still sleeping. The rest had to be super quick items that required no extra finishes - so the original plan was put away for another day! For Easter I was given one of those magazine recipe booklets and the candy corn sun was on the cover as a cupcake decoration ( there wasn't any cheese - but yellow icing instead). 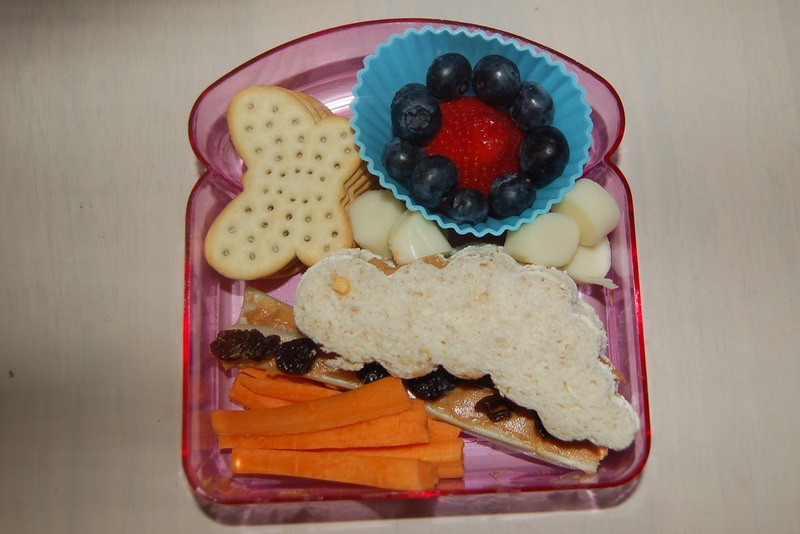 It reminded me of this sandwich on Cookie Cutter Lunch from about a month ago, and I thought it would be perfect for my plan. I used less candy corn than the originals as I just didn't want so much candy in my MTM today and a food colouring marker for the mouth as there was no time for anything else. 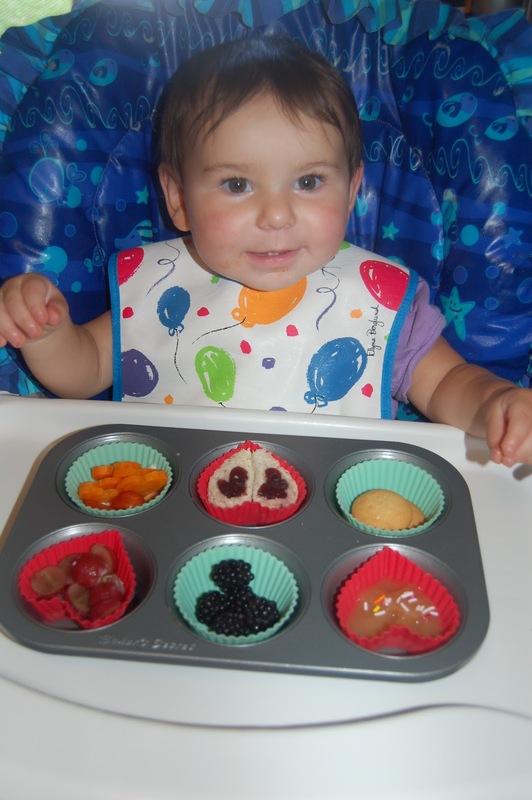 The booklet also had some really fun looking cupcake recipes in there that I can't wait to try! Here's what was left - she must have been starving! She's not usually this messy of an eater and she didn't eat a single candy corn. I don't think she missed the other fun elements! 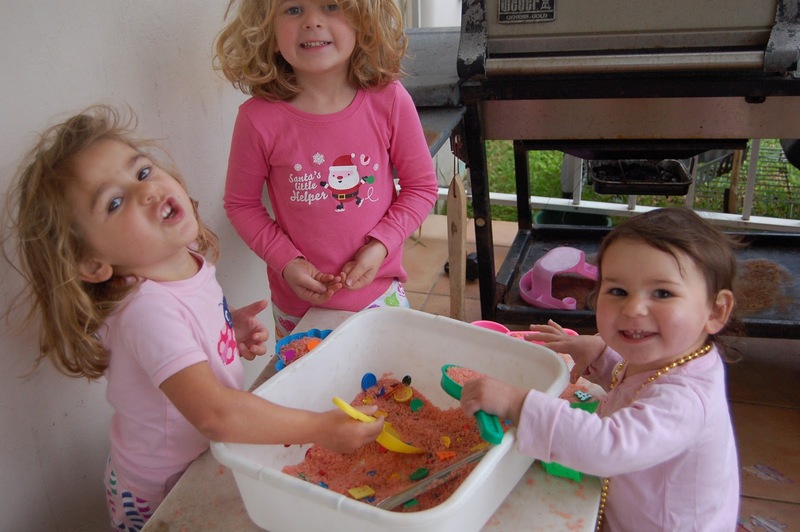 We had tons of fun Easter activities this past weekend. On Thursday we went to Rose's nursery for their Easter Egg Hunt and morning of fun. (Well not Amy as she was in school). We spent a lot of the time chasing Heidi around the playground! She'll be starting there in September as Rose leaves to join Amy at Montessori. This kids were supposed to find 3 eggs each and then turn them in to the teachers who doled out candy. Rose was quick - she finished second! Everyone was off for Good Friday so we had a blast at home with our own mini egg hunt, traditional codfish & potato breakfast, BBQ, a few games and kite flying with some family - my Mom has most of the pictures from egg & spoon, sack race & kites -I'll have to ask her for them. Normally we have a larger party with even more games but as I needed to take it easy for a few days it was much more low key than normal and only a few family members stopped by - the kind who stay and wash the dishes!!! I always organise so that each child has to find a certain colour egg. There is always a large age range - this time 1 year - 9 years old - and it makes it fair for everyone. You can hide the littlest one's eggs out in the open and really hide the older children's eggs. They generally all finish up at the same time, count to make sure they found them all, pop open their eggs sort their loot and sometimes trade the contents! I then collect all of the eggs to use again the next year. When there is a bigger party going on I also hide a special egg -like the golden egg idea - and anyone can search for it, grownups too. There is a special prize for finding that one - usually a huge chocolate bunny, but I hide that egg REALLY well. Counting to see if Rose found all of hers. Today we'll be off to my In-Laws for Easter Sunday Lunch and a little playtime with the cousins. The Easter Bunny brought some fun bubble wands so we'll take them over to share for a little outside fun - the weather has been great lately so we've been outside playing everyday. I'm quite sure spring has sprung! In honour of Earth Day the girls and I (plus my nephew) worked on a little project to recycle our broken crayons and turn them into new usable crayons. as it was our first time I searched the net and found several different tutorials then I came up with a plan. I gathered everything we needed. Mini muffin tin, cooking spray, all of the broken crayons and some cups to help sort the colours a bit. When everyone came home we started work. I saw many different ways to peel crayons online; using a mini craft guillotine, putting them in ice water and then just gold old fashion peeling. Since my children can usually peel the paper off in 10 seconds flat - we went with the old fashioned way. Since some of these were older and broken in bits on the inside it was a bit harder to peel the paper so Mom did the tricky ones. Nana showed up with lollipops so they were multi-tasking! As we peeled the crayons we kind of sorted them into colours. Blues & purples, red, pink, oranges, yellows, browns etc. This was a tip relating to making layered crayons but since there were several children all wanting to participate it was easier to share the colours this way as they created their new crayon combos. Next I sprayed the muffin tin with cooking spray. They all passed around the cups and filled the mini muffin tin with their broken crayon bits. When they were done I put them in the oven at 275F for 7 minutes. A few weren't quite melted enough so I added 2 minutes and then took the tray out to cool. They were supposed to just pop out when you flip over the tin and tap the back. Well some did and some didn't. I was able to run the edge of a sharp knife on the inside and pop most of the stuck crayons out. I think the problem was that some had not cooled off enough so I know to leave it even longer next time. The children were impatient so I guess I caved in when they seemed alright. Here are our best ones. A few of them broke when I tried to wrangle them out of the tray with the knife. I think the best choice would be to use a silicone triangle shaped tray next time. It's probably easier to coax them out of the silicone tray and the triangle shape is probably easier for colouring. All in all the kids had fun, we learned a new way to recycle and we used up lots of broken crayons that were just in the way! I hadn't yet given Heidi raw carrots and was worried about them being a choking hazard especially since I cut them into that shape! So after cutting them, I steamed them so that they were quite soft. I was very careful to watch her when she ate them and was completely compared to take them out and cut them smaller but she did just fine. She was very happy to see her lunch! When she started to eat, I realised the applesauce should have been in the first row so I just swapped the cups. I'm better about remembering to put any messier items on the front row now. I'm sharing this on the weekly Muffin Tin Monday post - so please hop on over and check out other MTM submissions! 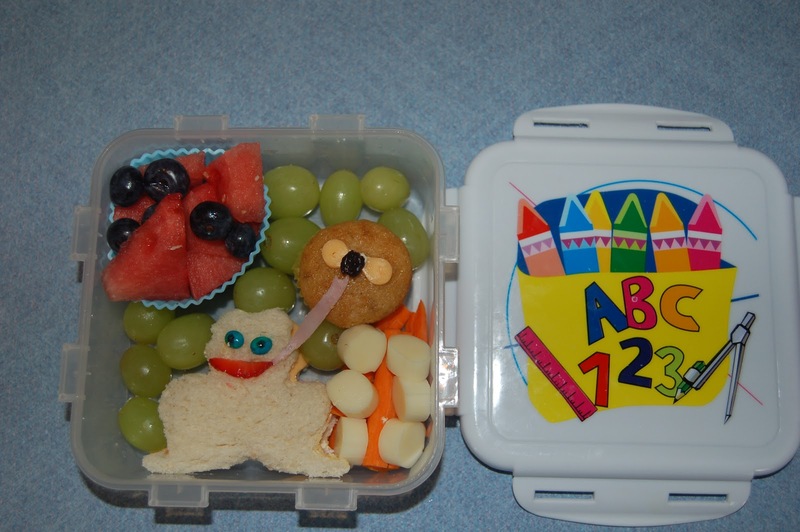 I have been making bento lunches and muffin tin meals for the entire school year but only recently did I begin blogging about them. So I decided to share a few of my past favourites including my very first bentos ever :) I had been looking at some blogs online, and had scouted out my local shops & baking supplies for some fun items. Then I placed an order online for some "fun stuff". It took a few weeks for my order to get here so this was made before it arrived with a cookie cutter that I already had and some cupcake picks I found in the baking aisle of a local store. as a "practice run" before starting the school year. 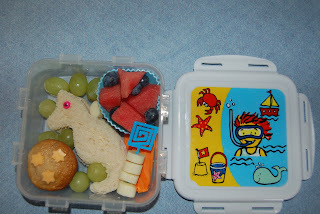 Rose's first ever bento lunch made the same day, Summer 2010.
cucumber sticks, mini apple cinnamon muffin. Then I did a little more blog surfing, local shopping (found a large set of animal cookie cutters!) 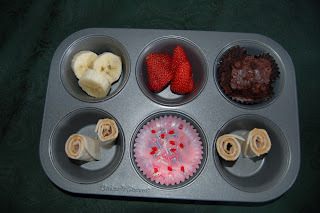 and then dug out some silicone baking cups that I had, and made these for the girls' lunch. 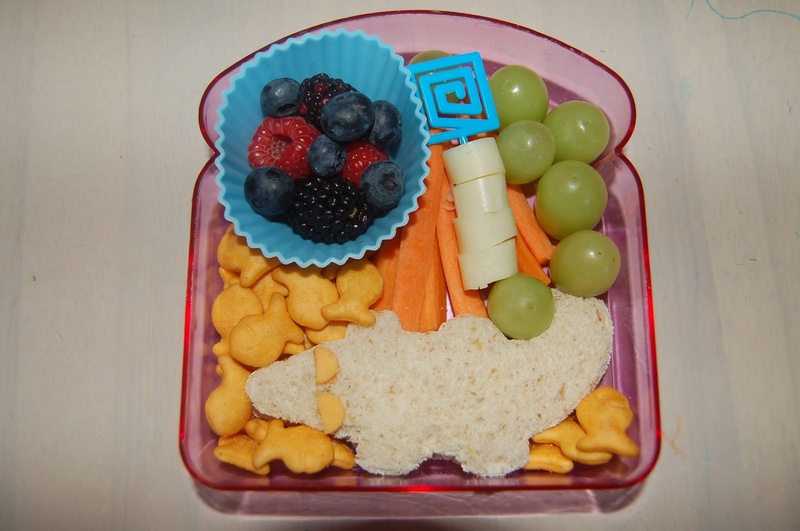 mixed berries, carrot sticks, string cheese, grapes. The next day I made these. This was the first time packing them up and taking them out with us. Previously we were just eating lunch at home. They travelled better than I expected! watermelon & blueberries, apple cinnamon mini muffin, grapes. apple cinnamon mini muffin, watermelon & blue berries. 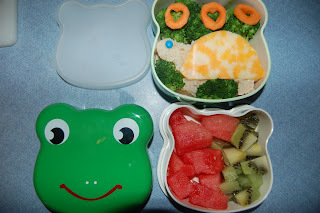 Then finally one of my orders came so we had actual bento boxes to use. I made these that same day! 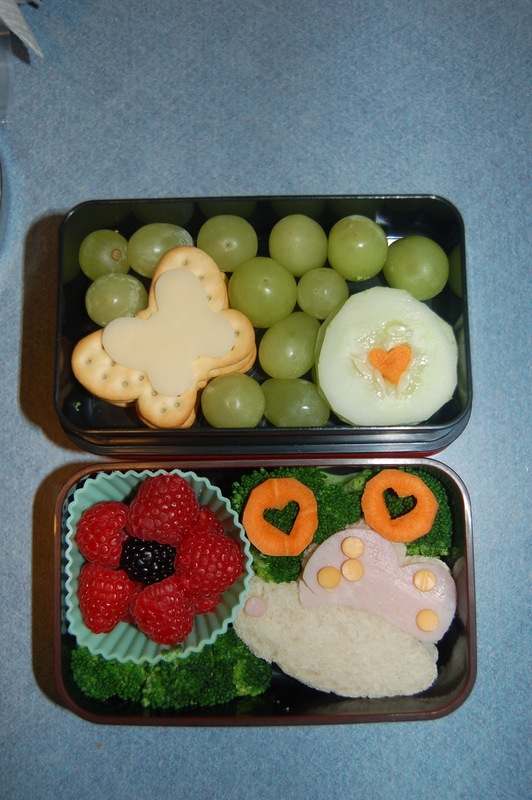 Butterfly crackers & cheese, grapes, cucumber slices, raspberry & black berry ( attempting another flower! ), steamed broccoli & carrots, Ham butterfly sandwich. I have been getting tons of use out of those animal cookie cutters as the girls prefer sandwiches for lunch on most days. 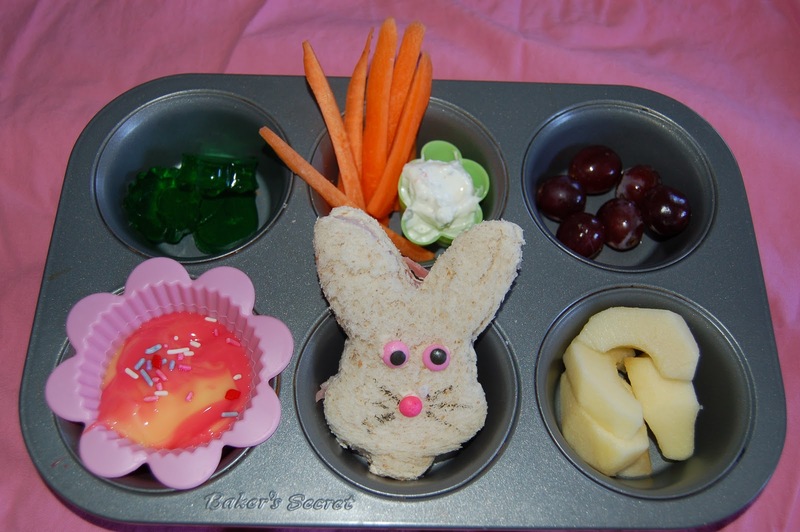 I still have tons of lunch photos including many Muffin Tin Meals. I'll get to posting some of them shortly. grapes, 1/2 orange, mac & cheese, yogurt with sprinkles ( this really is a vacation favourite! ), PB crown sandwich, crown icing decoration, apple stars. 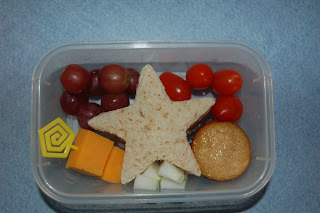 R's Lunch -pretty much the same. The center of the crown is a punched out heart. I let them put their own coloured sugar on those for decoration. I was going to adorn the crown with jewels - AKA Wilton large icing decorations, coloured diamonds, circles etc. but naturally the kids just could not wait an extra moment! Oh well it's less sugar for them anyway :) I was also going to make those star apples into wands but again - the kids were too hungry to wait! H's Lunch: even H was standing up at the counter eager to help! 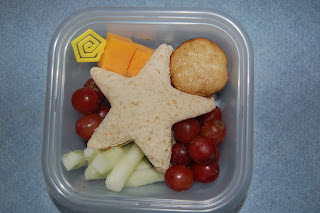 Halved red grapes, orange slices, mac & cheese, fairy princess PB sandwich (who looks a little sad), apple cutouts - the trimmings of the other girls' stars. 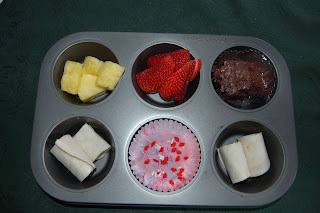 Here's our Muffin Tin Monday lunch from yesterday. It went along with the themes for the month. Everyone had the same - well A didn't have any dip since she prefers her carrots plain. All the same is much easier on Mom - I like those days - when they all agree! lime jello jigglers - mini shapes, carrot sticks with ranch, red grapes, 1/2 a trix yogurt with sprinkles, bunny shaped ham sandwich, sliced apples. Everything was eaten except the jello - a few bites left as they decided they don't really like lime jello all that much. I had bought a box with good St Patrick's Day intentions but never managed a special lunch that day. I like it - so needless to day it's all gone now! 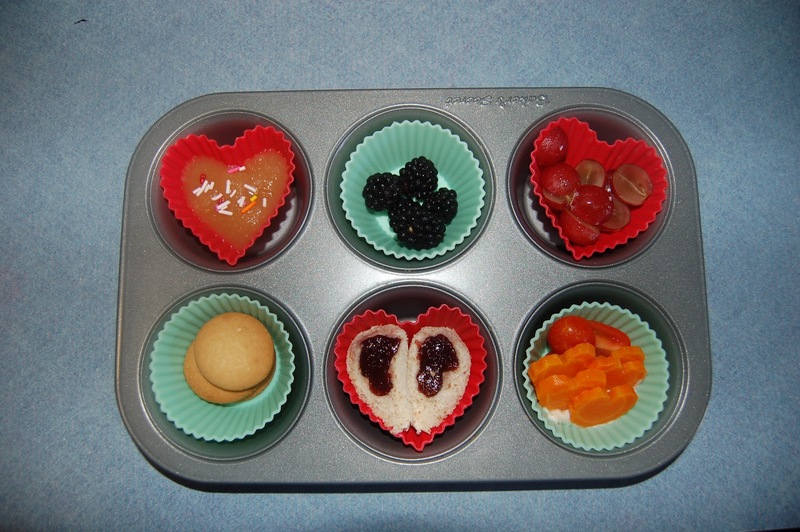 Check out Muffin Tin Mom if you want to see other Muffin Tin Monday submissions. My very first blog post - how exciting! The girls have been on school holiday for a week which is a nice break in routine for everyone. I've been feeling kind of yucky but still trying to keep them entertained with some fun activities. Fortunately the weather has been fairly pleasant so we've had lots of outdoor fun. I am working on two main projects right now - let's call them Operation Clean House and Mission Reduce the Grocery Bill. So far Clean House is a bust but there is progress on the Grocery bill! I've managed to make a meal plan for the month and more importantly STICK to it. Usually I have really great intentions.... but then abandon the menu. There's still time for old habits though as we're only on the second week of this plan - but I'm hopeful. Almost everyday A & R have asked for a muffin tin meal for lunch -that actually works well with the meal planning / reducing the grocery bill since I can use up little bits of this and that leftovers for their lunch. Creativity is dwindling on my part though! First Muffin Tin: All three girls had the same things. 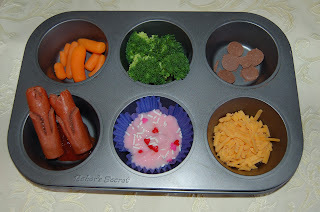 Baby carrots, steamed broccoli, choclate buttons, Tulip hot dogs ( H had diced hot dog bits) with ketchup underneath, yogurt with sprinkles & grated cheddar. They had crackers too - but I took the pics first, gave the *starving* children their lunch and then realised I forgot the crackers! Second Muffin Tin - Very similar nuffin tins for the girls. A's lunch - Pineapple, strawberries, brownie, peanut butter roll ups, yogurt with sprinkles. R's lunch is identical except bananas instead of pineapple. I never took a picture of H's lunch but she had the same as R that day except peanut butter sandwich squares, and Yo Toddler yogurt without the sprinkles. And finally our fun inside activity that ended up an outside on the porch activiy. I saw directions on another blog ( can't remember which one right now!) about how to make coloured rice for a sensory tub. Mix rice, 4-5 squirts of hand sanitizer and about 8 dorp of food colouring in a ziplock bag leave for a few hours or over night. so I thought hey that's easy, I'll try that. Don't ask me why I thought my three would play nicely with this inside and not spill the rice everywhere! The first thing H did was take a big scoop and dump it out on the table & floor. Oops - out they all went to play with it. I had put some sand shovels, small molds, buttons and sequins in the rice to amuse them. I still ended up with rice all over the porch but they really enjoyed it. Hubby said please don't make that up again -- I won't *wink *wink - at least not when he's at home! Anyway here's them outside playing - it was a really windy day but they didn't seem to mind.